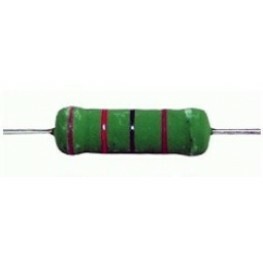 Superes resistors are the highest quality, but still affordable in price. They have long been the favorite of high-end audio manufacturers and DIY enthusiasts. 5 Watt Wire Wound Resistor. Very high heat handling with low linear temperature coefficent. 0.56 Ω 5 Watt Wire Wound, Ultra low-inductance resistor. Tolerance 1% - Inductance below 0.7uH. Di..
1 Ω 5 Watt Wire Wound, Ultra low-inductance resistor. Tolerance 1% - Inductance below 0.7uH. Dimen..
1.8 Ω 5 Watt Wire Wound, Ultra low-inductance resistor. Tolerance 1% - Inductance below 0.7uH. Dim..
2.4 Ω 5 Watt Wire Wound, Ultra low-inductance resistor. Tolerance 1% - Inductance below 0.7uH. Dim..
3 Ω 5 Watt Wire Wound, Ultra low-inductance resistor. Tolerance 1% - Inductance below 0.7uH. Dimen..
3.9 Ω 5 Watt Wire Wound, Ultra low-inductance resistor. Tolerance 1% - Inductance below 0.7uH. Dim..
4.3 Ω 5 Watt Wire Wound, Ultra low-inductance resistor. Tolerance 1% - Inductance below 0.7uH. Dim..
4.7 Ω 5 Watt Wire Wound, Ultra low-inductance resistor. Tolerance 1% - Inductance below 0.7uH. Dim..
5.6 Ω 5 Watt Wire Wound, Ultra low-inductance resistor. Tolerance 1% - Inductance below 0.7uH. Dim..
6.8 Ω 5 Watt Wire Wound, Ultra low-inductance resistor. Tolerance 1% - Inductance below 0.7uH. Dim..
8.2 Ω 5 Watt Wire Wound, Ultra low-inductance resistor. Tolerance 1% - Inductance below 0.7uH. Dim..
10 Ω 5 Watt Wire Wound, Ultra low-inductance resistor. Tolerance 1% - Inductance below 0.7uH. Dime..
12 Ω 5 Watt Wire Wound, Ultra low-inductance resistor. Tolerance 1% - Inductance below 0.7uH. Dime..
15 Ω 5 Watt Wire Wound, Ultra low-inductance resistor. Tolerance 1% - Inductance below 0.7uH. Dime..
18 Ω 5 Watt Wire Wound, Ultra low-inductance resistor. Tolerance 1% - Inductance below 0.7uH. Dime..
22 Ω 5 Watt Wire Wound, Ultra low-inductance resistor. Tolerance 1% - Inductance below 0.7uH. Dime..
27 Ω 5 Watt Wire Wound, Ultra low-inductance resistor. Tolerance 1% - Inductance below 0.7uH. Dime..
33 Ω 5 Watt Wire Wound, Ultra low-inductance resistor. Tolerance 1% - Inductance below 0.7uH. Dime..
39 Ω 5 Watt Wire Wound, Ultra low-inductance resistor. Tolerance 1% - Inductance below 0.7uH. Dime..
47 Ω 5 Watt Wire Wound, Ultra low-inductance resistor. Tolerance 1% - Inductance below 0.7uH. Dime..
56 Ω 5 Watt Wire Wound, Ultra low-inductance resistor. Tolerance 1% - Inductance below 0.7uH. Dime..
62 Ω 5 Watt Wire Wound, Ultra low-inductance resistor. Tolerance 1% - Inductance below 0.7uH. Dime..
68 Ω 5 Watt Wire Wound, Ultra low-inductance resistor. Tolerance 1% - Inductance below 0.7uH. Dime..
75 Ω 5 Watt Wire Wound, Ultra low-inductance resistor. Tolerance 1% - Inductance below 0.7uH. Dime..